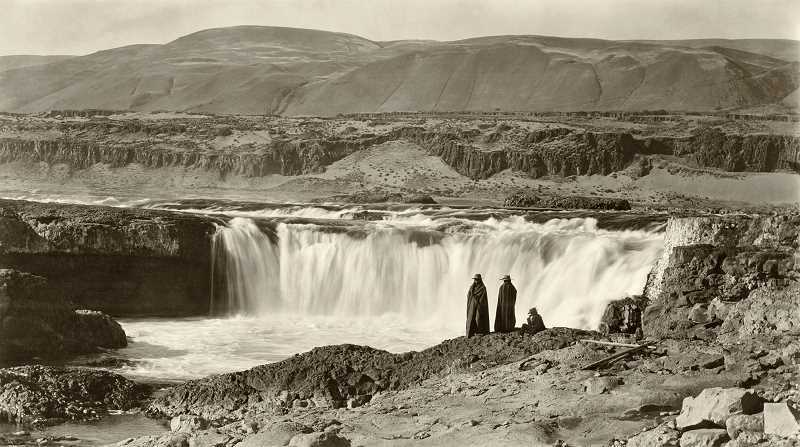 Celilo Falls on the Columbia - 1900: This view of three men looking over Celilo Falls is one of photographer Benjamin Giffords better-known photos, and rightly so. It combines excellent technical quality, good composition and a poignant story. Our version is restored from a sharp original boudoir card - a popular size of scenic photo about 4.5 x 7.5 inches. Note that the young man on the right is wearing western-style clothing. He may have been home visiting from one of the boarding schools of the time.